We’re back for the concluding week of the Dragonflight Group Read, put on by Carl at Stainless Steel Droppings. There was a fantastic discussion ranging across several blogs last week (see my post and long comment thread), so I look forward to seeing everyone’s thoughts on the end of the book! I wish we knew more about the Threads. They’re generally treated as though they’re malevolent, and yet not sentient, or even properly “alive.” So I guess the malevolence is mostly metaphorical. At the same time, I wish I had a clearer picture of whether they are alive in a conventional sense, or have any kind of intelligence. I think not–but there are just a few hints that make me think it would be fascinating if they were. But presuming they’re not, I do think they work effectively as the antagonist in a man-versus-nature conflict. They’re the ultimate natural disaster, capable of destroying all life completely, requiring an equally impressive protagonist in the dragons (and their riders) to fight back against them. I really enjoyed the way the time travel played in, particularly the way Lessa and F’lar went back into their own pasts. The circular nature of the way events played out will make my head hurt if I think about it too much, but ultimately I think it worked. I would be skeptical about no other dragonriders stumbling on this–but I know in Moreta it’s revealed that other dragonriders did know in the past, so I’ll let that one go by. I’m glad we have this question, because I really wanted to talk about some of the characters who came in later in the book. Mostly I wanted to mention that I LOVE Masterharper Robinton! He just has a small part here, but he’s one of my absolute favorite characters in all of Pern. He’s so splendidly charming and just a truly good person and character. Plus the harpers are really the storytellers of Pern, so how can I not love the Master Storyteller? He has a much bigger part in The Harper Hall Trilogy, but his character comes through in Dragonflight too. I also think Fandarel, the Mastersmith, is just wonderful. He reminds me of Scotty, with his dedication to his craft. He’s such a striking character too. I can see him so vividly, physically looming and so entertaining in his mannerisms. 4. We talked about it in the first discussion and there is no way we can get away from it in Part 2: What are your feelings on the progression of the relationship between F’lar and Lessa throughout this second half of the book? I read the whole book before answering last week’s question, so the entire course of their relationship was influencing my earlier discussion on this subject. I do think things get better in the second half of the book. F’lar starts treating Lessa with more respect, and there’s more of a sense of the two of them working together on their problems. And then, it becomes clearer that they really both care about each other. I think I can ultimately like F’lar because he’s so devastated when Lessa disappears between times. He does have a heart! 5. And finally, what is your overall assessment of Dragonflight? How does it measure up against other classic science fiction you’ve read? Would you recommend it to modern readers, why or why not? We talked some last week about this being influenced by its time of writing, but it doesn’t really feel like old science fiction to me, the way Burroughs or Asimov do. I don’t know if it’s the style or the writing or something else, but it doesn’t feel particularly like it’s from another time in writing. As to a recommendation, I probably would have recommended this before rereading…now I think if I want someone to read Pern, I’m going to push the Harper Hall Trilogy on them, and if they like that, then Dragonflight would be a good follow-up. It’s not anything to do with whether it’s classic or not, but I think the Trilogy is a better introduction to the world, even though it’s set chronologically later (and I think I recall spoilers for Dragonflight). Pern is a pleasanter place in the Trilogy, and I feel like I remember clearer explanations on some of the worldbuilding elements. So I guess the conclusion for this question is that I’m recommending to all in the group-read that they should go on to read Dragonsong! That actually segues nicely into the one other element I wanted to mention–the poetry! I’m not a big poetry fan, but there are bits and pieces of Pernese Harper songs that have somehow worked into my mental landscape. I really enjoy the peek it gives us into Pernese literature and culture. And it’s often stirring or beautiful poetry! Of course, part of the appeal of the Harper Hall Trilogy is that we get to explore life in amongst the people who write all that poetry. 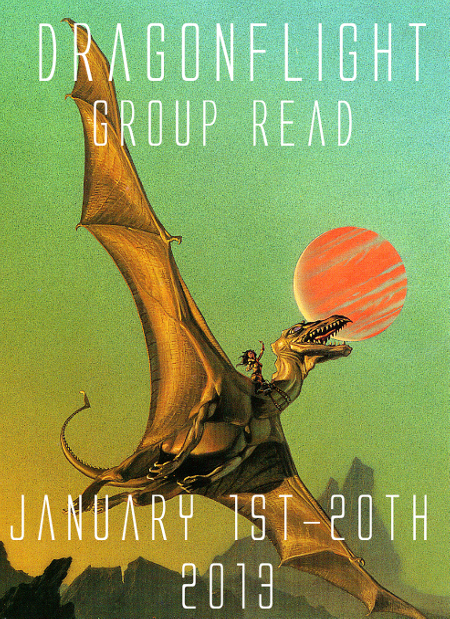 I think that wraps things up…I really enjoyed revisiting Pern with the group, and I’m going to try to go back to a few other books throughout the year. A big thanks to Carl for hosting, and to everyone who joined in–I’ve loved reading your thoughts. 🙂 Go here for everyone else’s posts! 1. I think it makes a very nice change to see a conflict that is not a real war. I also like the mystery of what exactly the Thread is and that Pern’s society simply reacts to the threat without being able to analyze it. Also, it’s origin on another planet seems to make it a problem that could never be truly resolved. 4. I think they both find it very difficult to open up and admit that they need someone else, especially Lessa who has spent so many years being reliant on only herself. I am quite sure that they would have opened up to each other eventually, but this incident brings their emotions to the fore and makes them realize how they feel. I just wish that he would not shake her! 5. I’m a firm believer that this series needs to be read in publication order because it takes the reader on such an interesting journey of discovery as the history of Pern is fleshed out and the world-building is expanded. I have a suspicion that reading the books in chronological order would remove some of the mystery and appeal of the earlier books. I also like the use of the Harper songs / poetry because it shows the importance of oral traditions when it comes to relating very important information and stories. We tend to forget that it is only in the last few hundred years that reading has become the main method of transmitting or history and traditions, up until then everything was passed along orally. I was particularly impressed by the idea of the Question Song being so eerie and unpleasant to the ears that it could produce a real sense of fear and threat. I also like the oral tradition of the Harper songs…I think it’s a perfect example of how Pernese society is very different from our own, but works along its own lines. They don’t have the printing press, so they have other ways to preserve and share information. I also am not particularly a fan of poetry, but the little snippets that McCaffrey built into the story were quite a nice touch as they point to lost knowledge and a bigger scope on things. I’m definitely looking forward to continuing the series. Cheryl, I wish we knew the “why” of the Threads. I was left with that niggle and in the end they were not exactly what as I expected. I absolutely agree that even with the “time travel” as a science fiction device, Dragonflight had more of a fantasy flavor. At least it did for me. I love that you included the poetry in your post! I enjoyed the snippets throughout the book and actually went back after finishing the book to enjoy them again. I’ll be curious to see what you think of the rest of the trilogy! It’s been years for me, but I think I remember that the second one has more about how the Threads work, and more about F’nor. I don’t know if you’ll like everywhere it goes, but there may be a few answers. I still have mixed feelings on F’lar, but yes, points for growth! And the Masterharper and the Mastersmith are just brilliant! I was also thinking that the fantasy element – and particularly giving it a mediaeval feel – helps to prevent the book from becoming dated. I also go all dithery with the time travel. I start trying to really think about it and usually have to give up because you frankly can just go round in circles. In terms of F’lar, whilst he got on my nerves last week it was not in a bad way and this week has completely turned things on their head. Clearly I’m very fickle because I can’t help really liking him now. Just his dedication as a leader, he came across very moderate in the way he treated people and at the end he finally showed his real feelings for Lessa. F’lar definitely does have a turn-around in the second half of the book. I think in my hazy memory, I really only remembered later-book F’lar, which may be one reason encountering early-book F’lar sent me skidding about in confusion and uncertainty! As I mentioned to Deslily in the comments on my post, I am aching to read Dragonsdawn as it is, as I understand it, the origin story of the Threads first attack, the dragons, etc. I think the Threads turn out to be an even more formidable enemy than a sentient being who could be eventually overcome once and for all. You get the idea that unless there is a way to somehow stop things happening at the source, the Red Star, then this natural disaster is going to be one that is endlessly repeated and with that they cycle of knowledge being forgotten, time passing and people considering Threads a myth, etc. will also continue. Reminds me of what Tolkien called the “long defeat” that the elves fought. Moreta is another book I’m dying to read…again in large part due to the fact that I’ve liked that Michael Whelan cover forever. That desire has increased after her mentions in Dragonflight. The circular nature of time travel stories is indeed headache inducing if you try to think about it too much, but it is part of the fun of time travel stories when you don’t. I liked that Robinton didn’t get introduced into the story just to be some kind of double crosser or something along that line. That would have bitterly disappointed me. It certainly feels less dated in a lot of respects and I think a large part of it is because it uses a very familiar fantasy-style setting which doesn’t really show age the way science fictional settings often do over time. The “prehistoric world” feel of this may be old as a storytelling idea but as long as you like that setting it generally doesn’t feel as dated regardless of when the author wrote it. Plus she doesn’t have a lot of gadgets involved which will make a work feel dated. I enjoy poetry although I don’t pretend to be any expert. I know what I like and that is about the extent of it. I liked the poetry here because it had a purpose. It is a fact that learning things by song, rhyme, meter is often easier and that knowledge will last longer (I’m 44 and I can still remember word-for-word a bunch of the School Rock songs from cartoons when I was a kid) and so that serves the story well as the means with which this long-forgotten knowledge would stay in the minds of people, even those who don’t believe. Plus it lent a great air of mystery to the proceedings. I mentioned a second group read in my comment back to you on my site. reading everyone’s thoughts on The Pern Series just thrills me to death…I have loved them for so long and reread them a number of times and never tire of them.. I realize not everyone will like them and it is very hard to hear “any faults” lol.. but I am hearing much more good then bad..
Glad to hear you’re having fun! 🙂 This was a much beloved series for me when I was younger, and certain books (and characters) still hold important places in my heart. So I too am enjoying watching people explore Pern! I do understand that it is hard to see anyone take a more clinical look at our beloved books. Just do what I do which is let that stuff slide off. I honestly would not have rated Dragonflight much higher if at all higher in my estimation if it hadn’t had what *I* consider a few opening issues, issues in mechanics more than anything else. She more than redeemed those minor complaints. I have some of those complaints about some of the Stainless Steel Rat books and they are my babies. Doesn’t stop them from being my favorite books. Perfect story execution isn’t everything and clever ideas mixed with memorable characters and heart go a long way towards covering up blemishes. Sometimes the stories I love most are the ones I also nitpick about flaws the most. It’s as if because they’re SO good, I can see every little spot where they don’t quite live up to themselves. And it definitely doesn’t mean I love them any less! Maybe books are like people. Sometimes we love them in part BECAUSE of their imperfections. So true. And I guess I expect some imperfections from SFF written from the time of Burroughs up through the 70’s because it was largely written by men and largely written to a certain standard that was passed down from generation to generation in the genre. The occasional stand out really STANDS OUT in that respect. In a way, maybe the more obviously dated books can get away with some kinds of flaws, because when I read them I figure they’re just a product of their time. Dragonflight, on the other hand, doesn’t feel as dated, and so the gender issues feel more disturbing. Somehow the same problem never bothers me in Burroughs, who’s so obviously from 1912! I agree, and also think part of it is the fact that this book was written by a woman, and you wouldn’t expect a female author in the late 60’s to have some of the same uncomfortable gender issues in her book that so many male authors had before her. My memory of Dragonsdawn is pretty hazy, but as I recall it’s the origin story of how humans came to Pern, first encountered Threads, dragons, etc…it has a much more sci fi feel, since it gets into the origins of things that, by Dragonflight, have become fantasy-like legends. I love your point about Threads as an ongoing threat that can never be completely defeated. Some of the much later books in the series explore the possibility of ending the threat from the Red Star for good…and that was around the same time I began losing interest. I think the loss of that eternal struggle removes much of the impetus of the series. Although I don’t really know if they get rid of Threads forever; I think I stopped before that. Great point as well re: the fantasy style keeping the book from feeling dated. It’s almost like historical fiction, which is clearly in its own time period, and so it doesn’t matter as much how it relates to the readers’ time. Sci fi tends to have a more direct connection to our own time, with current conditions informing the fictional world–and so we get that dated feel when “current conditions” change. Or so it seems to me. Hmm. All very intriguing! I reread The Ship Who Sang last year, which is pretty much straight Sci-Fi and I was very pleasantly surprised at how well it had aged. I am not sure how she managed it, but Ms McCaffrey’s portrayal of technology in it did not feel at all clunky or out of date, apart from her use of magnetic tapes to transmit data.